(Jennifer Thompson) He may be a human rights champion but the 84-year-old lives a simple life in a Catholic community — and likes 1970s pop -- Having decided as a young boy to dedicate his life to the Catholic Church, Joseph Zen knew he would be renouncing many elements of a private life, including the luxury of residing in his own home. Yet the grounds of Hong Kong’s Salesian House of Studies, a stolid four-storey cream building located at the eastern end of Hong Kong Island, nevertheless bear his subtle mark. The 84-year-old cardinal has retired to live within this religious community but he can still recognise several trees overlooking a small football pitch that he planted while based here as a teenage novitiate, which he points out from the flat roof where he likes to stroll in the evenings. “Life was very simple but joyful because we were a group of young people,” he says, recalling his initial days here studying with about 20 others, a period that also included plenty of football matches. In the seven subsequent decades he was to have several more stretches living at the complex while based in the Chinese territory, and he returned in 2009, the year he stood down as bishop of Hong Kong. Originally from Shanghai, Zen is known internationally for his work championing human rights and religious liberty. He is often described in the media as the “new conscience of Hong Kong”, his activism coming amid intense scrutiny of civil liberties in Hong Kong and mainland China. In 2013 he was the recipient of Canada’s John G Diefenbaker Award, which honours those who champion human rights and freedom. Even in his retirement, he remains a well-known figure, willing to take to the streets in the city’s mass pro-democracy marches in 2014. Built in the 1930s, Salesian House is a neoclassical complex perched on a sloping road among high-rise apartments, its exterior shaded by banyan trees. The Salesians of Don Bosco is a religious institute, founded in the 19th century by the Italian John Bosco, who placed particular emphasis on improving the lives of young people. 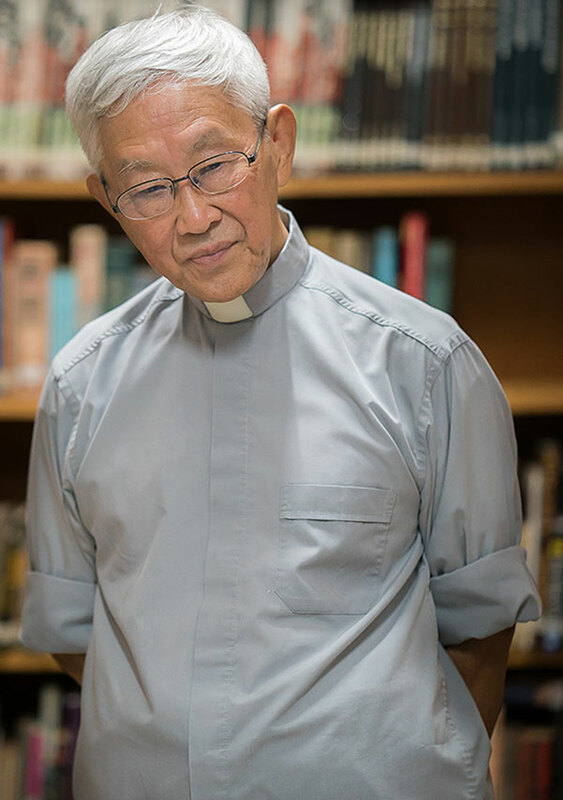 Beyond his ecclesiastical duties, the cardinal has spent most of his professional life teaching philosophy in religious institutes and seminaries in both Hong Kong and on the Chinese mainland. He still does so part-time, as well as participating in pastoral care activities such as prison visits. Wearing a plain grey shirt with a clerical collar, sleeves rolled up to counter the sweltering heat of a Hong Kong summer’s day, he conducts a low-key tour of the premises. The building is reminiscent of a school, with tiled corridors and plain walls, although the installation of air conditioning and a lift have made conditions a little more comfortable than during his early days in residence. Portraits of the handsome Bosco watch over the corridors but the atmosphere is relaxed and informal. The building was designed for function rather than form, and was used as a medical store by Allied forces during the second world war. The site has a tragic past. Some medical personnel based there in December 1941 were executed nearby by invading Japanese forces. Zen slept in a dormitory on the second floor when he arrived. Now he has a small cell two levels up, allowing easy access to the roof. Communal life begins early with a service in the small, bright chapel at 6.15am and breakfast in the dining room at 7.30am. The size of the community varies from year to year and is composed of missionaries studying Chinese, priests requiring temporary accommodation and a handful of elderly and infirm priests who are cared for full-time on their own floor. A few lay staff are also present. For the Catholic Church, the establishment of a new political order was a major setback. Christianity was reluctantly tolerated and churches could operate only under heavy state control. Critically, religious appointments had to be approved by the authorities. As the close relative of a man dedicated to a foreign religion, Zen’s younger brother was denied his college diploma and forced to leave Shanghai in order to seek employment, while the difficulty of travelling in and out of the country meant Zen’s mother died before he was able to see her again. Zen’s parents had converted to Christianity as young adults. His father had wanted to enter the priesthood himself but was advised by a missionary that this path was not suitable for a neophyte. Instead, he married and nurtured the hope that his first son would take up the vocation, which was fulfilled, albeit only after five daughters were born, two of whom died in infancy. “So my father had to wait,” Zen notes wryly. After spending almost a decade in Italy in the late 1950s and early 1960s studying for a doctorate in philosophy, he returned to Hong Kong to teach. For much of his early adult life and middle years, his career was unremarkable if successful. Yet amid the political uncertainty before and after Hong Kong’s handover in 1997, as well as his own elevation to the bishopric in 2002, he became increasingly outspoken on civil liberties. “The doctrine in the Catholic Church is we must be present in society,” he says simply, by way of explanation. Zen was a vociferous opponent of a government anti-subversion bill in 2003, which saw 500,000 people take to the streets to protest. It was later dropped. He later headed a long-running fight, which was lost, against legislation which reduced the role of the Church in running Catholic schools. He has also drawn the ire of Beijing for his call for more open discussion of the Tiananmen Square massacre as well as his defence of Falun Gong, a banned Chinese spiritual movement. He sounds particularly strident on the question of whether there is any possibility of restoring diplomatic relations between the Vatican and Beijing. Chinese Catholics are only permitted to attend churches controlled by the Chinese Patriotic Catholic Association, a body which answers directly to the Communist party and does not recognise the Pope. Zen is now looking forward to some respite and is scaling back his teaching duties. In his leisure time he enjoys listening to music, both religious and lighter fare. “I’m an old man so I like pop songs from the ’70s,” he confesses, mentioning bashfully, when pressed, that he likes The Carpenters. Free time is also spent catching up with the news online and he is a member of Facebook, where he posts regular updates.